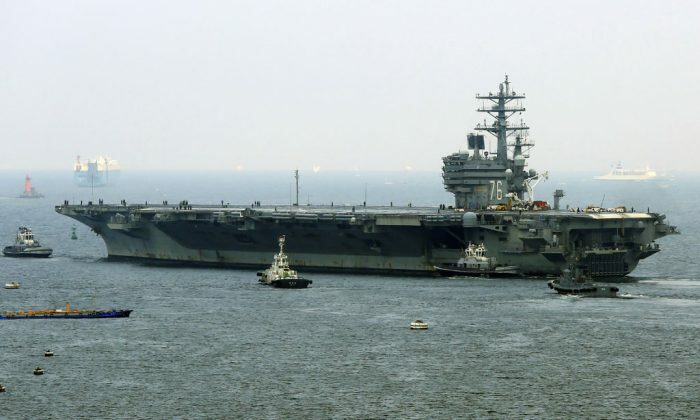 The United States is expected to deploy aircraft carrier the USS Ronald Reagan to waters near the Korean peninsula this month for a joint military exercise with South Korea’s Navy, according to South Korean Yonhap News Agency. “We are in consultations (with the U.S.) on a plan for the aircraft strike group led by the nuclear-powered USS Ronald Reagan to operate in the East Sea around Oct. 15,” a South Korean defense official told the agency Sunday on condition of anonymity. The Reagan will likely be accompanied by several other warships such as an Aegis destroyer, a guided-missile cruiser and a nuclear-powered submarine, Yonhap News reported. The United States and South Korea will perform joint drills involving detecting, tracking, and intercepting the rogue regime’s ballistic missiles. They will also conduct drills on anti-submarine warfare training, according to the official. “It’s likely to hold the combined training around Oct. 20. The exact schedule has not been set, depending on the conditions. And then it will likely make a port call in Busan,” he said. News of the drills came as President Donald Trump said on Sunday that he told the top U.S. diplomat not to waste his time trying to negotiate with North Korean leader Kim Jong Un. “I told Rex Tillerson, our wonderful Secretary of State, that he is wasting his time trying to negotiate with Little Rocket Man,” Trump wrote on Twitter, using his nickname for Kim. Tillerson said during a trip to China on Saturday that the United States was probing North Korea to see whether it is interested in dialogue and that it had multiple direct channels of communication with Pyongyang, Reuters reported. This was the first time the Trump administration acknowledged it was in direct communication with Pyongyang. The disclosure came as Tillerson expressed hope for reducing tensions with North Korea, which is fast advancing toward its goal of developing a nuclear-tipped missile capable of reaching the U.S. mainland.